Britain from Above is ‘An epic journey revealing the secrets, patterns and hidden rhythms of our lives from a striking new perspective. Britain looks very different from the skies. From a bird’s eye view of the nation, its workings, cities, landscapes and peoples are revealed and re-discovered in new and extraordinary ways. The series uses cutting edge technology allows you to see through cloud cover, navigate the landscape and witness familiar sights as never seen before. The Centre for Advanced Spatial Analysis (home of digital urban) assisted in organising and refining vast hordes of information such as the 2001 Census, the intricate network of railways and even the GPS traces of 400 London taxis. It was really interesting to see the data we collated used in the film, its a ‘not to be missed’ show, August 10 on BBC One at 9pm and BBC Two at 10pm. But none (15:15 CET) of the small visualization videos is working here from Denmark. Does you know if BBC block video content for people outside UK? Or it’s also not live yet in UK? The small visualisations should work – the actual programme on BBC iplayer is UK only. Of course Mininova could be somewhere to look for it after Sunday…. A well made show although ruined by being heavily biased towards London – is it just the wider availability of data for London which makes the BBC / Digital Urban focus only on that area? 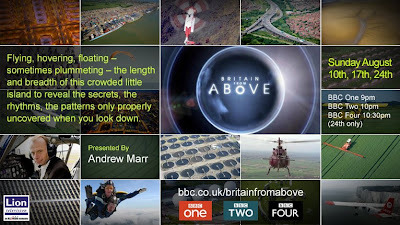 Hopefully the next episodes of Britain from Above will feature slightly more of Britain itself. It was heavily focused on London, although we cant speak for the BBC on this one. As for the blog Digital Urban, its simply because its where we work and therefore if we have a new technique to try out it is easy to use a London scene. All the techniques obviously work regardless of location and we aim to have a balance by featuring a selection of work outside of the UK and indeed London. Who was responsible for converting the data into 3D visual effects please? It was beautifully done – an effective use of the technology.